A PROJECTOR WAS NEVER THIS AFFORDABLE. ZAKK UC28 LED HOME PROJECTOR. 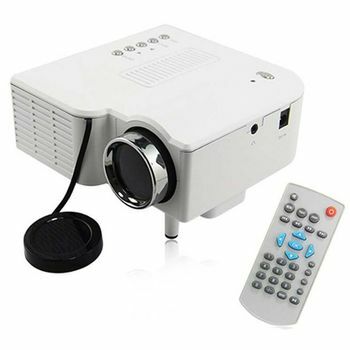 A SMALL & PORTABLE PROJECTOR EASILY CONNECTS WITH YOUR DEVICES SO THAT YOU CAN ENJOY THE BIG SCREEN THEATRE EXPERIENCE AT HOME. THE PROJECTION SCREEN RANGE SIZE IS 20 - 60 INCH. NO NEED OF CURTAIN FOR CLEAR PROJECTION (DARK ROOM IS REQUIRED). USEFUL FOR HOME, SCHOOLS, OFFICES.PLUG & ENJOY SET TOP BOX, USB, TV GAME CONSOLE MP3/DVD/VCD PLAYER. CONNECT CPU THROUGH VGA OR HDMI PORT AND ENJOY BIG PROJECTOR SCREEN FOR PRESENTATION. COMPACT AND TRAVEL FRIENDLY. 1. DUST-PROOF DESIGN, MAKING YOU FREE FROM DAILY INTERNAL CLEANING. 2. THE LED LAMP CAN WORKS FOR OVER 20 THOUSAND HOURS. 3. MANUAL FOCUS ADJUSTING, GET PICTURE FROM 20 TO 60 INCHES. 4. LOW POWER CONSUMPTION, SMALL AND LIGHT AND EASY TO CARRY. 5. CHANGE IN 16:9 AND 4:3 ASPECT RATIO EASILY. 6. MAXIMUM RESOLUTION:1080P FOR DISPLAY SIZE OF 20-60 INCHES. 7. USB, SD CARD (UP TO 32 GB), DC IN, AND HEADPHONE. IT ALSO HAS A SLOT FOR THE INCLUDED MINI TRIPOD. 8. SUPPORT MOBILE PHONE WITH MHL TO HDMI FUNCTION. 9. CAN BE USED WITH TV SET TOP BOX,USB, TV GAME CONSOLE MP3/DVD/VCD PLAYER. A PROJECTOR WAS NEVER THIS AFFORDABLE. ZAKK UC28 LED HOME PROJECTOR. A SMALL & PORTABLE PROJECTOR EASILY CONNECTS WITH YOUR DEVICES SO THAT YOU CAN ENJOY THE BIG SCREEN THEATRE EXPERIENCE AT HOME. THE PROJECTION SCREEN RANGE SIZE IS 20 - 60 INCH. NO NEED OF CURTAIN FOR CLEAR PROJECTION (DARK ROOM IS REQUIRED). USEFUL FOR HOME, SCHOOLS, OFFICES.PLUG & ENJOY SET TOP BOX, USB, TV GAME CONSOLE MP3/DVD/VCD PLAYER. CONNECT CPU THROUGH VGA OR HDMI PORT AND ENJOY BIG PROJECTOR SCREEN FOR PRESENTATION. COMPACT AND TRAVEL FRIENDLY. KEY FEATURES : 1. DUST-PROOF DESIGN, MAKING YOU FREE FROM DAILY INTERNAL CLEANING. 2. THE LED LAMP CAN WORKS FOR OVER 20 THOUSAND HOURS. 3. MANUAL FOCUS ADJUSTING, GET PICTURE FROM 20 TO 60 INCHES. 4. LOW POWER CONSUMPTION, SMALL AND LIGHT AND EASY TO CARRY. 5. CHANGE IN 16:9 AND 4:3 ASPECT RATIO EASILY. 6. MAXIMUM RESOLUTION:1080P FOR DISPLAY SIZE OF 20-60 INCHES. 7. USB, SD CARD (UP TO 32 GB), DC IN, AND HEADPHONE. IT ALSO HAS A SLOT FOR THE INCLUDED MINI TRIPOD. 8. SUPPORT MOBILE PHONE WITH MHL TO HDMI FUNCTION. 9. CAN BE USED WITH TV SET TOP BOX,USB, TV GAME CONSOLE MP3/DVD/VCD PLAYER.